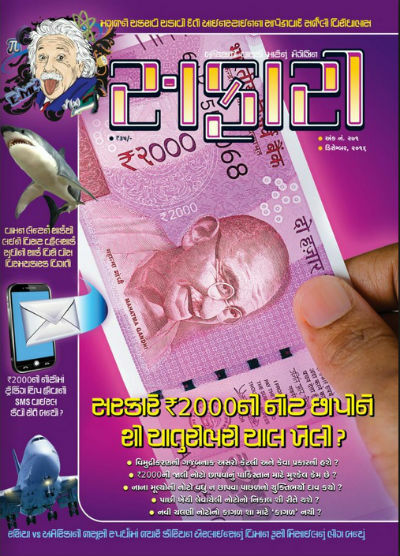 December 2016 issue of Safari – a knowledge and science magazine from India – Gujarati edition – published on time. As we have expected, there is an article about recent effort of Indian government to drag out the black or undocumented money by banning high currency notes with immediate effect. It is worth to note that a few of the issues of this magazine we read on Magzter app (which is a digital magazine store / newsstand). We wrote in detail about our experiences in respective articles. This time though, we read the print edition and the reviews are for the same. The cover page of the magazine nicely gives brief listing of all major articles available inside. It is quite Pinkish in theme and having the photograph of new Rs. 2000 currency note and exploring a detailed article on recent action taken by Indian government towards Demonetization. While there is a lot talked and written about this move of the government of India. Majority of people are in favor of curbing the high currency notes. As the exchange of high currency old notes needs to be done through banks and other authorized bodies (like post offices), the unaccounted currency notes are taken-in into the banking system. In long term it is going to have positive impacts. The other major benefit is people will be moving more towards the cashless banking (i.e. the use of debit/credit cards, EFT, use of mobile wallets, money transfers and more…). We also need to make our bank and other financial systems more secure and make people believe that their digital data is safe. In growing IT world it is a challenge. Anyway, there is an article in the magazine which takes a balance look at cancelling 500 and 1000 Rs. notes as a legal tender by replacing them with 2000 Rs. and 500 Rs. notes. The article focus on 4 major points and they are worth to take note of. The article also gives brief history of how currency came to effect and it starts with talk about the “barter system”. We suggest that as new currency notes are having some salient security features, and all users should be aware of them. Not knowing them will make it easier for the con-artist to give you fake notes. Here is a video from SBI (one of the largest bank in India), exploring these features. There is a separate article on this incident in the magazine. The article is written by D. N. Kaushik. You will enjoy reading it for sure. This article shows how people always get chance to spread rumours for almost anything. And when there are people who love to just “forward” the message they got, without any fact checking, it goes viral. We have a desperate need to keep our mind open. We consider “the editorial” an important part of any print media. It not only give the editor a chance to interact with the readers directly, it also works as a bridge between the readers and the editor. While editor usually talk about his/her vision for the content of the issue in the editorial, it also gives him/her a chance to share his/her voice on the latest happenings. Reading about the background and preparation for this adventure trip is inspirational. We are looking forward to get the book on it which is intended to be published in next year. We will than share our views and reviews for it with you all. It seems that the theory of relativity and Albert Einstein are to be remained immortal :). When we think we have read enough on this topic, there comes a new aspect and make the topic alive. There is an article by Nagendra Vijay about it in this issue and it is an interesting read. While it provides you significant information about the topic, it doesn’t bore you at all. You will actually enjoy reading it. In an attempt to explore a historical incident and finding the facts about it, Nagendra Vijay comes again with another article in the magazine. There was a time (and it is not ended yet) when there was cut throat competition between USA and USSR (now Russia) to prove oneself better than the other in almost every aspect. This competition resulted into many great achievements and it have witnessed some mishaps too. Rather than talking much about this article, we would suggest you to read it. It gives a good insight to some of the remarkable historical incidents. And knowing history will make us wiser, as we got to know what to do and what not to, based on the results of such actions in the past. Which mountain is considered as deadliest by the mountaineers? How much time a NASA space shuttle require to travel 1 light year in the universe? Where is the grave of Albert Einstein (in USA or Germany or anywhere else)? What is the fuel economy of a Railway Diesel engine? Why the drivers keep the engine running even when the train is stationed? How does the “Speech Recognition System” work in computers? Which wrist watch is used by NASA scientists who control the actions of robotic vehicles on Mars (as the days on the Mars are not of 24 hours)? The article about various species of Shark and some interesting facts about the all, is definitely a good read. Super Quiz is another article which you should not miss. There are a number of magazines appear in the market every month, however a very few of them are worth your time and money you spent for it. This issue is definitely worth going for.